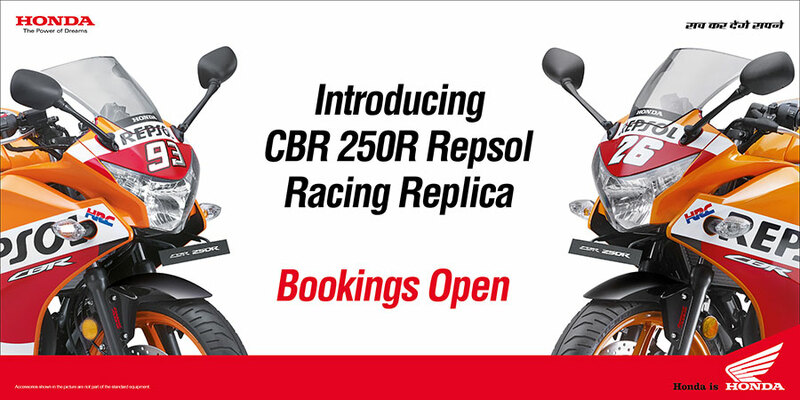 Celebrating Honda’s phenomenal success at the MotoGP 2016 Season, Honda Motorcycle and Scooter India (HMSI) today announced the bookings open for the new limited edition CBR 250R – ‘The Repsol Honda Racing Replica Limited Edition’. The new edition of the CBR 250R will be available in two different versions: Marc Márquez 93 and Dani Pedrosa 26. The bookings can be made at any of the Honda Exclusive Authorised Dealerships across India. The CBR 250R is powered by a liquid-cooled 250cc, 4-stroke, 4-valve single -cylinder DOHC engine delivers 26 BHP power and 22.9 Nm torque@ 7000RPM. Powered by Combined Anti-lock Braking System, CBR 250R comes with an electronically controlled fuel injection technology – PGM-FI that significantly enhances the performance and fuel efficiency while the O2 Sensor and Catalytic converter makes the CBR 250R Eco-friendly. With unrivalled comfort, superb throttle and fun of maneuvering, CBR 250R is sure to woo the riders’ senses. After witnessing the exemplary performance and success of Repsol Honda Team at the at the 2016 MotoGP season, we wanted to offer customers and racing enthusiasts, a unique experience of owning their very own Repsol Racing Replica motorcycle. We have adopted Team Repsol Honda paint & graphic scheme directly inspired by the legendary RC213V including the numbers of our star riders, Marc Márquez and Dani Pedrosa. The 2016 season of the MotoGP has been extremely successful for the Repsol Honda Team with Marc Márquez securing 12 podiums finishes and 5 pole positions. The 23-year-old Marc Marquez received MotoGP World Champion trophy after taking the title in October at the Twin Ring Motegi. Honda has also won the Constructors title in the 2016 MotoGP World Championship.